This page was created by Jessica Evans, a senior math major at UCSB (link to author's page). Leni Rifenstahl played a major role in the Holocaust, whether it be intentionally or as an innocent particapant. After learning about her in lecture, I was very interested to learn more about this woman who seems so contradictory. My research consisted of internet resources (sources). Leni Riefenstahl was born in Berlin in 1902. Her father, Alfred Riefenstahl, was a prosperous businessman dealing in heating and ventilation. Her mother, Bertha Sherlach, had been a part-time seamstress before she married. 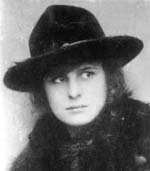 Their first child, Helene (Leni) Bertha Amalie Riefenstahl, was born on August 22, 1902 in the family's apartment on Prinz-Eugen-Straße in Berlin. Leni's younger brother, Heinz, was born three and a half years later. He died at the age of 38 during WWII at the Russian front. Riefenstahl studied painting and started her artistic career as a dancer, but an injury of the knee put an end to her sensational career. After that, she became famous as an actress, a film director, a film producer and a film reporter. She became world-renowned as an actress, especially for her role in The Blue Light in 1932. When Hitler came into her life, Riefenstahl was already an accomplished actress and director. Like many Germans living in economic despair at the time, she found the Fuhrer charismatic and lauded his efforts to build national socialism, by her own words unaware of his ultimate intentions. Although Riefenstahl denied all accusations, there were rumors about a relationship between herself and Hitler. Riefenstahl held that her relationship with him was purely professional. She was granted the dream of every filmmaker, an unlimited budget, to photograph the annual Nazi Party rally of 1934, she created Triumph of the Will , an inestimable propaganda tool in building the myth of Hitler-as-savior. This film brought her greatest success: The gold medal in Venice in 1935 and the gold medal at the World Exhibition in Paris in 1937. However, at the end of the war this film destroyed Riefenstahl's career, for it was no longer recognized as a piece of art but was condemned as a National Socialist propaganda film. Her world-famous film about the Olympic games made the same experience. That film also got the highest awards: the gold medal in Paris in 1937, the first price in Venice as the world's best film in 1938, the Olympic Award by the IOC in 1939, and in 1956 it was classified as one of the world's best ten films. Olympia represents in some ways a quantum leap in film, with Riefenstahl using unheard-of techniques to fix the reality of the moment onscreen. Olympia , and later her series of photography books on the Nuba tribe, brought criticism that Riefenstahl's image of the perfect body was a fascist ideal. On the other hand, her portrayals of the physical beauty of black tribesmen showed a contradiction with Hitler's pathological race theories. After the fall of the Nazi regime, Riefenstahl took up photography. The pictures she took of her visit with the Nuba tribe were published in many different publications worldwide. And later, at the age of 71, Riefenstahl fulfilled a dream to herself: She attended a diving course to allow her to work as an underwater photographer in the future. Soon she became a master in this profession too. She published two illustrated works. In 1987, Riefenstahl published her memoirs, which have been released in 13 countries and reached a high circulation mainly in Japan and in the USA. She worked untiringly on the finishing of her first underwater film, and that is why she visited the most wonderful diving areas repeatedly. Even at the age of 94, she dived in Cocos Island (Costa Rica) and took pictures of sharks. Even more unusual was her decision at the age of 97 to travel to Sudan which was being isolated because of the civil wars which had been going on there for many years, in order to research the fate of her beloved Nuba and to bring them help. For 23 years, Riefenstahl could not get access to the area and therefore had no information to the Nuba. After long efforts, she finally had it, and she was even able to contact the rebel leader. Together with a small film team provided by the Odeon-Film Company, she traveled to Khartoum in February 2000 accompanied by Horst Kettner, her assistant of many years standing. First after a long time of waiting and hard negotiations, the team could travel to the Nuba mountains under the protection of a military convoy. Thousands of Nuba people were waiting for Riefenstahl, but because of the breaking out of new fights, she was forced to leave the Nuba mountains immediately. The team was forced to leave by a helicopter. After a stopover in El Obeid the helicopter crashed. Riefenstahl had to be taken by a rescue plane to a German hospital where they found that she had suffered a number of rib fractures. Despite this dreadful accident, she refused to give up her plan to travel the Sudan once again to help her Nuba friends. Riefenstahl's status as a filmmaker is unquestioned, even when her motives are obscured. She says she was never a Nazi party member, and never anti-Semitic. At Nuremberg, she was labeled a sympathizer but not an activist. On the other hand, her denial of using gypsy concentration camp members as extras in her film Tiefland , is undermined by a requisition list, shown in close-up in The Wonderful, Horrible Life of Leni Riefenstahl , that names these people and the purpose for their brief transfer from the camp to her sets. Still, a case can be made for Riefenstahl as an artist so obsessed with the need to create something perfect and outwardly beautiful that she allowed herself to ignore, if not become complicit with, tragic historical forces. The often-imitated, seldom-honored artist remained a controversial and unrepentant pariah up until her death on September 8, 2003. Ironically, her own well-crafted black-and-white motion-picture images of Hitler, Nazi pageantry, and the Jesse Owens Olympics helped keep both her genius and her past alive. In the words of Ray Müller, director of the documentary The Wonderful, Horrible Life of Leni Riefenstahl , "Her talent was her tragedy."